I got my first exposure to the brilliant Karl Urban when I watched Dredd earlier this year and ended up enjoying it a lot. The film was great, visually engaging – and although Urban didn’t get much in the way of facial expressions he delivered a pretty impressive Judge Dredd. So Urban was one of the main reasons why I tuned into Almost Human, and he delivers the role with a great performance and is easily going to be one of the things that I can see carrying the show. 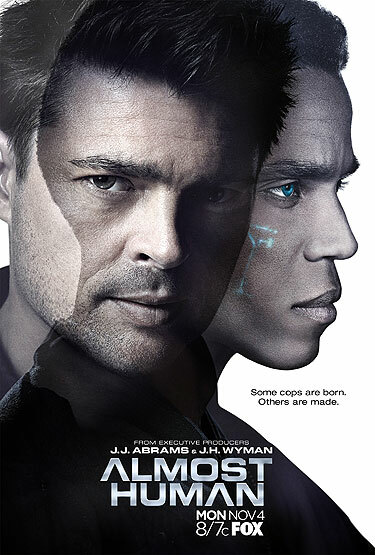 It is the year 2048, and Detectives now are required by law to work with androids, much to the disdain of Detective John Kennex (Urban), who has survived a devastating Police ambush now finds himself working with an Android named Dorian (Michael Ealy, FlashForward) who is an older model of Androids that suffered from the flaw of becoming ‘too human’. The episode itself delivers a great, well paced introduction into the near future world of crime solving, even if it’s basically like every robot film you’ve ever seen before blended with a dash of buddy cop drama for good measure. I can imagine fans of Robocop, I, Robot and Dredd enjoying this one – it’s slick, pacey and entertaining enough to get the audience on board regardless of its flaws. The show deals with the premise very quickly – within the first five minutes. Urban nails the role of Detective John Kennex in a pretty strong way and Michael Ealy isn’t bad as well, delivering some strong performances. Elsewhere across the board there’s Minka Kelly (Charlie’s Angels, Parenthood), as Valarie Stahl, Mackenzie Crook (Pirates of the Caribbean, Game of Thrones) as Rudy Lom and there’s also Lili Taylor (Hemlock Grove) as Captain Sandra Maldonado. There aren’t really any actors or actresses who I felt didn’t really fit the tone of the episode and it was good to see them playing their roles well with some engaging scenes between the characters. It’s great to just sit back and enjoy the entire episode – because I think the best thing about this series is that it’s fun. It may not be the most serious and well developed show ever, but Almost Human is a damn fine show and far from a bad one. Heck, it could even end up taking over spots from Sleepy Hollow, The Blacklist, Orphan Black, Peaky Blinders & The Escape Artist as my favourite new shows of 2013 given time – because it’s certainly very promising with some great potential. Aside from the fact that this show is full of clichés, there are a few more weak spots here and there. The future doesn’t really look that much like the future. Aside from the odd CGI shots of futuristic transport and androids and advanced methods of communication there isn’t many things that are different – even the cars still look pretty much the same. Then again, Almost Human is set in 2048, and not the 41st Millennium. There’s also the fact that the MX’s (androids) look way too creepy for standard human interaction, so their design is a bit flawed in that respect. However, one thing that this show does succeed in doing is surprising the audience – I expected Kennex’s dislike of Dorian to be dragged out for the entire first season but it’s quickly and smoothly wrapped up within one episode. This leaves the show open for a fresh new dynamic – hopefully it won’t be a boring case-of-the-week drama like so many other shows before it, but instead take new and interesting leaps. Given time I’m sure Almost Human could become the next best sci-fi thing, and I’m certainly going to be sticking with it for sure.